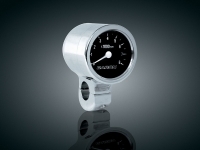 Add this pristine 3" bullet tachometer to your bike and gain accurate engine performance and style! Choose between the "White Face with 7 Color L.E.D. Lighting" Tachometer or the "Black Face Tachometer with backlighting". With 0-8,000 RPM range this tachometer is designed specifically for motorcycles to eliminate tach bounce. Includes everything you need for a swift and easy installation. Now you'll love watching your RPM's!